Coca-Cola and GE are teaming up to join the Department of Energy’s Workplace Charging Challenge. Two big companies that lend credence to the electric car market. Coca-Cola & GE Push Electric Car Charging Network. 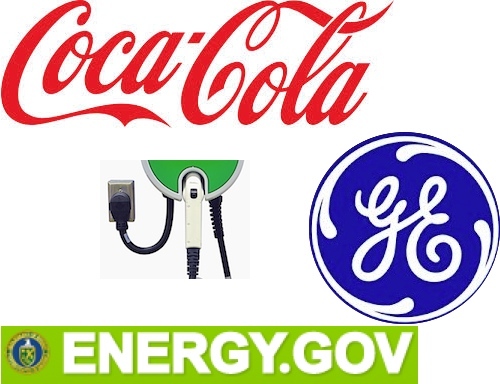 Coca Cola, America icon of soft drink and fast food have teamed up with another American energy icon, GE in order to facilitate the expansion of the Department of Energy’s (DoE) Workplace Charging Challenge. Along with other companies eager to join forces with the federal efforts made to extend the reach of the electric car charging network, these companies bring much weight to the developing electric car charging network. Who’s Who. Regrouping the who’s who of this industrial world, such as the original onboard companies, Google, 3M, Siemens, Verizon, Duke Energy, Eli Lilly, Chrysler Group, Ford, GM, Nissan, San Diego Gas & Electric and Tesla. The group has since then grown to include; Dell, Facebook, Hertz, AVL, Bentley Systems, Biogen Idec, Bloomberg, Hartford Financial Services Group, National Grid, NRG Energy, Osram Sylvania, Raytheon, Plug In America and Southern California Edison. According to the Atlanta Journal-Constitution, Coca-Cola and GE are both pushing for s strong electric car charging network by coming onboard the Department of Energy’s previous project I wrote about, Workplace Charging Challenge; Plug In America Helps DoE Charge at Work. Get At The Workspace Charging. When it comes to the feasibility of electric cars on a wider adoption scale, one thing is holding it back, range. With the possibility to charge at work, you essentially double your range, if not add another third. This is probably one of those instances when a Government push in an industry segment that needs a jump start actually can work, especially when we consider who joined this program, private companies that epitomizes what we do best, give the initial thrust and let the industry deal with bringing into the market. Why Is It Important To You? The idea to charge more frequently has many benefits. For one thing, we park long enough to top off our battery pack or even keep an electric car’s charge going, even recharging completely. Imagine the previous night you went out and didn’t recharge your electric car back home? No problem, you still have enough to get to work where you will plug into a Level 2 charging station. Let’s say now you have to make a detour and that adds anther 20 to 30 miles. No problem, you are charging at work. The world of charging stations, its infrastructure and management is in a complete state of inventing itself, consolidating and spreading its reach ever further. But beyond that, charging at the workplace liberates the electric car and gives it a much needed extra range lease for its drivers and this Coca-Cola & GE partnership helping the DoE’s Workplace Charging Challenge shows how electric car are here to stay.